Above, a 1938 aerial of 'Harbor Hill', the Clarence Mackay estate designed by McKim, Mead & White between 1899-1905 in Roslyn. Click HERE and HERE for more on 'Harbor Hill'. 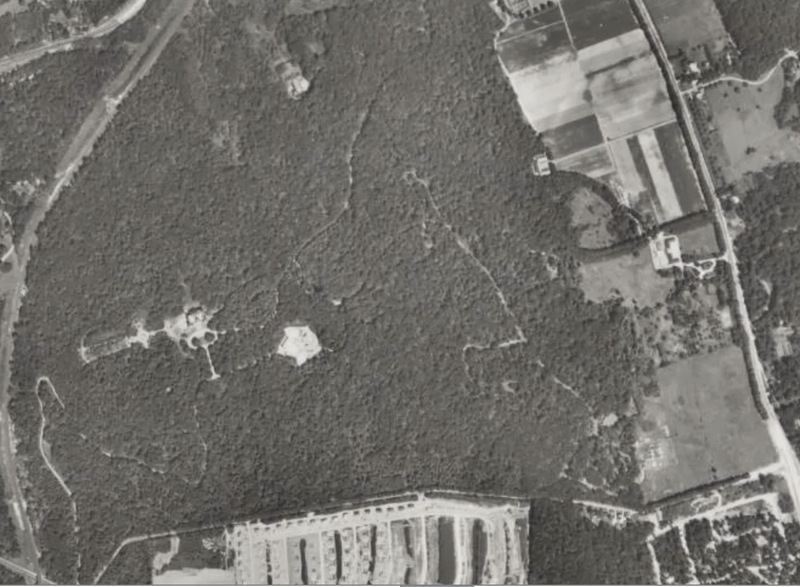 Below is another aerial that appears to be from a year or two before the above image. Photos from Stony Brook University's Digital Archive. The road running east west along the bottom of the image is Harbor Hill Road. The one running north south on the right side is Glen Cove Road and the one on the left side is Roslyn Road. Wow. What, if anything, was the house being used for in 1938? The encroaching development to the south even at this early date defintely sealed Harbor Hills fate. Is there anything left of this place? Any gates or walls or things like that? I believe that was one of the Levitt's many Strathmore developments they were undertaking in the late 1930s (including in Manhasset and Great Neck). If I remember correctly that parcel of land was in the name of Mackay's son who had his own estate on the other side of Glen Cove Road...far enough away that he must have felt okay selling it off. This image was taken the same year Mackay died. 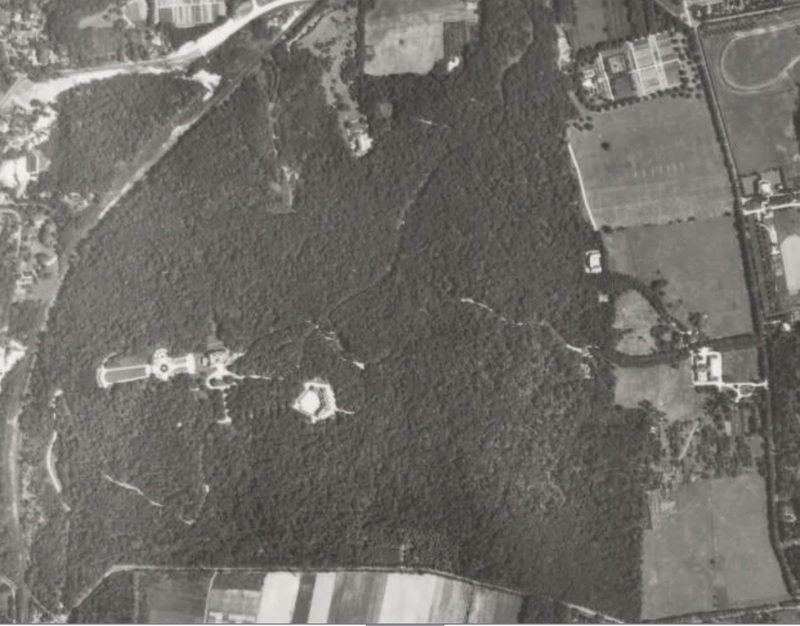 Does anyone know what that structure is almost parallel to the main house on Glen Cove Road? Levitt built very attractive residential developments back then. His Strathmore development off Shelter Rock Road is quite beautiful. I also thought it was mentioned in the excellent book on Harbor Hill that because his presumed inheritance had dwindled so far after the depression, the son had no hopes to live in nor even maintain the estate on his own. Another remnant is the Horse Tamer statue, a rare survivor from the elaborate gardens that stood for years on the grounds of Roslyn High School, but I think has been moved? There are two horse statues that you can find in Roslyn. One has sat in the middle of the driveway at Roslyn High School for many years. The one archibuff linked to used to sit in situ in the backyard of a house that was part of the development. Before those owners sold their house they donated the statue and it has since been re-erected on the grounds of the Roslyn Duck Pond (Gerry Park). So the 1939 map shows the entirety of the Harbor Hill estate seen in this posting listed in the name of Mackay's son John W. Mackay (550 acres). The developed portion was in the name of C.H. Mackay, though he had been dead for a year at that point. The parcel directly below that belonged to 'East Hills Realty'.